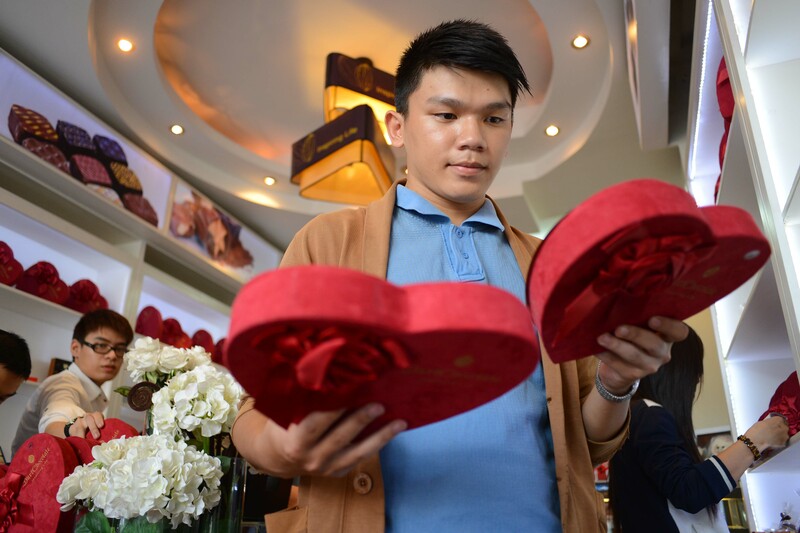 A man chooses gifts for his girlfriend on Valentine's Day in Ho Chi Minh City last year. Editor’s Note: Stivi Cooke is an Australian expat living in Hoi An City in central Vietnam. Yep, that day is heading our way again. Valentine’s Day – the day you’d better get right if you have a Vietnamese girlfriend or wife. Get it wrong and she’ll turn into the most evil creature with a sweet smile you’ve ever seen. Forget all those yummy meals, back rubs and sofa cuddle moments while watching yucky romantic movies because you want her to be happy. If you blow this one, you’re going to be reminded a million ways you’ve only seen in horror movies. My girlfriend sometimes calls me the most unromantic man on the planet. Half-true. This is said despite my efforts to remember our monthly anniversary of when we first met and buy her regular weekend hit of chocolate and indulge her passion for fine cuisine, even though I desperately needed that money for my Internet bill. I guess it must be that Vietnamese habit of saying what they think to the foreigner without thinking about it...much. Ah, it’s a great time. I gotta love the terrible attempts by university students sitting forlornly at a traffic roundabout with a few slightly tattered flower arrangements, trying to sell me a bunch of flowers for four times the going rate. My other favorite is the sniggers of my local shopkeeper as she informs me with a happy smile that she’s forgotten my honey’s ‘must have’ brand of chocolate and she won’t be getting more for another month (more happy smiles). Valentine’s Day in Vietnam is rather cute if a little bit overdone sometimes. Remember all those impassioned and horribly public displays of love with candles by love-struck boys trying to catch the girls of their dreams on Facebook last year? Yuck-oh. Come on, kid, what’s wrong with good old-fashioned flowers and a sense of discretion? Actually there’s a little park near the main drag in Hoi An where the young lovers sit and chat, daringly sitting close enough together to scandalize the traditional mums. It’s slightly dark so there’s some cuddling going on with their bikes positioned like curtains. The innocence of it all tickles me as I ride past in the late evening. At least it’s tastefully done. Da Nang’s widespread but somewhat un-noticed trend is teenage cafes. Most of them are quite groovy and decorated in that weird jumble of clashing colors, unrelated objects and romantic kitsch that encourages teenage flirting. The menu is strictly sweet drinks and fast food. Palm trees placed for maximum privacy are a must. Still, flowers and dinner never fail to create that warm, female glow that you know will keep you in healthy hot dinners for a long time to come. But be warned, cheap stake street stalls on cold chilly nights are likely to put you in a nasty Facebook complaint to her friends the next day. Vietnam’s love affair with food fits the romance of the day like a wooden cart to an old Honda cub. While we oldies frown on the phone chat and emoticon obsessions of young Vietnamese, the phone companies love it – they probably make more money than those times when Vietnam plays football with anyone. Still, it’s quite weird to observe boys and girls sitting across from each other in a café, glued to their phones yet grinning and giggling without looking up – they’re texting cheeky love pokes to each other! All kidding aside, love in Vietnam is a beautiful, passionate, affectionate, mad affair. It’s not just romantic love either. Office girls give flowers to their best friends. Dads give them to their wives. Grandparents might sit in the garden and smile wistfully at the flowers they planted 40 years ago. Vietnamese generally don’t separate out love into categories, the western world’s great loss, but call each other ‘brother’ and ‘sister’ in a love of comradeship, friendship and valuing other people’s qualities runs deep within the culture. It’s expressed in the giving and sharing of food, the laughs and teasing, the pushing and poking and most of all in that constant touching each other, the physical affection that bonds the people. Even expats receive the quick touch or hug, the all powerful Vietnamese sign of deep liking and fondness which is so hard to ignore. So remember to get it right on February 14, then again - perhaps the Vietnamese have always done Valentine’s Day right.